THE SEAPORT THEATRE is owned and managed by General Growth Properties. They too understand the need to maintain a healthy environment and quality of life for future generations as one of the most important challenges of our time. GGP feels this is a challenge we must all rise to meet. The following is GGP's commitment to environmental actions and awareness. "It is not easy - nothing this important is ever easy. It will take time. GGP is committed to addressing this challenge through responsible use of natural resources and waste management. This commitment is aligned with our enduring corporate values. Our [GGP] stakeholders expect it, our long-term success as a company depends upon it, and, it is simply the right thing to do. As a real estate owner and developer with over 210 million square feet of property space and millions more under development, GGP has a tremendous opportunity and responsibility to facilitate change in this area. We [GGP] embrace sustainability as an intrinsic part of how we do business, in the goals we set, the decisions we make, and the processes, programs and places we develop and manage. By doing so we are improving our business and contributing to economic growth in our communities." We are excited to have the support of General Growth Properties (GGP) and the South Street Seaport. For the next year we will work with GGP to bring culture and environmental awareness to the Seaport. We are honored to join the other arts organizations in the space who are also helping to revitalize downtown Manhattan. We are fortunate to have the option of utilizing three different spaces at the Seaport. 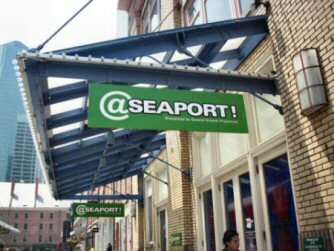 The @ Seaport location at 210 Front Street, also known as the Seaport Theatre, will be the site of the majority of our mainstages. We also look forward to the possibility of using their outdoor venue at Pier 17. The @ Seaport location works in correlation with our mission: the space was a women's retail store that went out of business and with the help of theatre companies, like Dog Run Rep, it has been repurposed into a theatre.